It's a furniture store. No, it's a home design store. No, wait - it's a furniture and home design store on drugs, a lot of different drugs at the same time. It's an Everything Store for the Design-Conscious. The only connection between most of the stuff for sale in Morba is that it will seriously funk you up. It's actually possible to O.D. on Cool in Morba. This space is so crammed that they even have chairs hanging from the ceiling and walls. 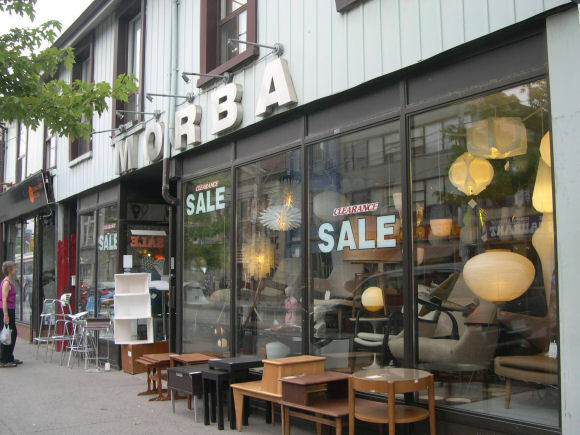 This is the Toronto haven for Scandinavian mid-century design, with plenty of inexpensive reproductions to keep you from going bankrupt too quickly. "Morba" may sound like the bad guy from a 1930's Flash Gordon serial, but it's actually syllables from the two owner's names. Still, I like to think that if Flash-Gordon's arch-nemesis "Morba" retired, he might open this kind of place. Morba is where Toronto's lighting goes to be seen. Every weird lamp ever created must be stashed somewhere in this packed warehouse / lounge. 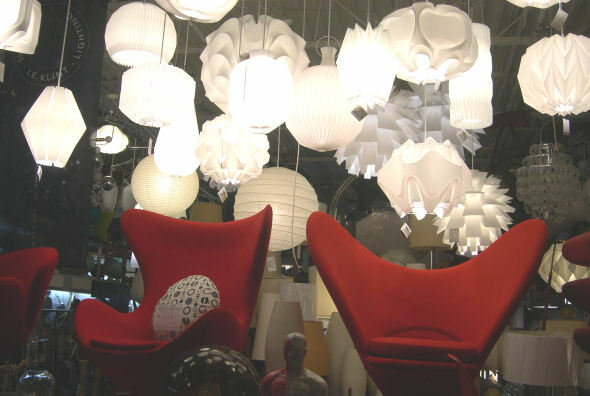 There are orbital clouds of original Le Klint white hanging lamps for $275-500, all of them hand-made in Denmark. But there's more. 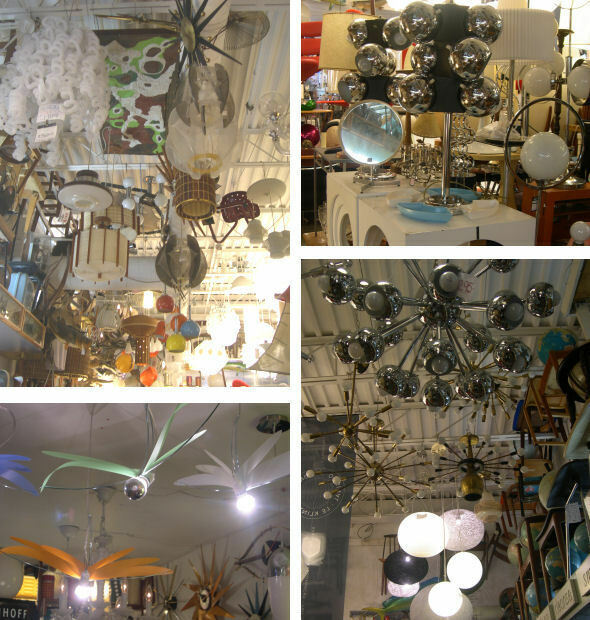 I found silver bubble lamps for $79, funky desk things, globular glowy things, organic shiny objects that look like they were designed by enthusiastic microorganisms, curlicues, pods, Japanese lanterns, multicoloured bubbles, lamps with protuberances, orange lamps, pseudopods, and even a flock of soaring dragonfly lamps with glowing heads. Some of the lamps are even made in Canada. I didn't know we were that interesting. Chairland makes its contribution, too. Barstools hovered two metres above me, from about $100-300 each. There was a lot of really rad seating for the right repose--like, dig it, man. The repro designs rocket to Earth straight from the inner beatnik within all of us. Why not get a George Nelson bubble sofa for $1189 resplendent in orange and purple leather? 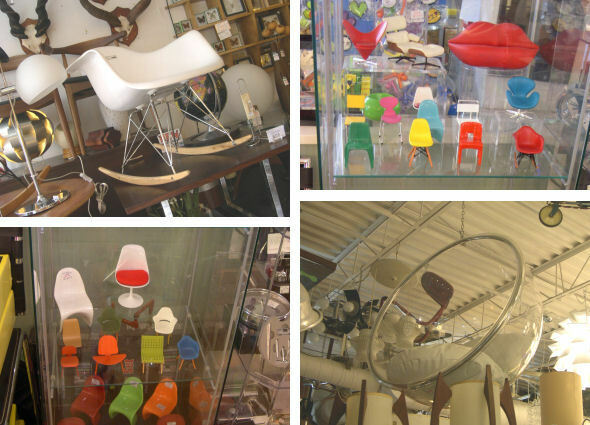 There are bent metal chairs, lattice seats, loungers, swivel chairs, rockers, a hanging acrylic bubble chair (try getting up there to test it out), and everything the Plastic Age could make. If life-size is too big for your apartment, there are exact replicas in micro versions. You can get that bubble sofa for only $14.95, if you don't mind it being 10 cm tall. Clocks, clocks, clocks, what would we do if we couldn't keep track of time and say it in a zillion ways. If the lighting is out of this world, the clocks are from some other galaxy. I'd say that at least they all had faces, or displays, but some of them disturbingly didn't. They have vintage furniture. Most of it was airdropped in from the 1940-60's and has "Bungalow" written in capital letters all over it. I won't easily forget the circa 1943 Westinghouse exercise bicycle. Morba once rented it to Holt Renfrew for a window display. It's huge, an ancient cast-iron behemoth, from a time when "portable" meant "a whole bunch of guys with a forklift can move it if you really need to". It has an overpowered electric motor, and when the guy turned it on, the electromagnetic hum and flailing handlebars inspired me with images of housewives with big hair in curling irons working out while wearing horn-rimmed glasses and watching I Dream of Genie in between commercials for dish soap and boat-shaped cars. But it was shiny and I wanted to take it home. Alas, even at $695, I had nowhere to put it. I met vases, glasses, accents, and objects d'art (or maybe just plain old objets). Some of the glass stuff had slinky shiny metal friends who came along for the party. Morba sells bugs encased in plastic, which I personally think is more than a little bit gruesome, but I guess preserved beetles with massive yawning jaws might have a place somewhere. But if actual dead insects in plastic are too realistic (or not realistic enough), there are also Anatomical Model Kits in Full Colour for only $47. What 12 year-old wouldn't want an anatomically correct model of Insert Animal Here, say a snail? They even have a mammoth. Given that mammoths have been extinct for over 10,000 years, I wonder how they modeled the model. And if whole dissected plastic animals don't catch your fancy, they have Bitz, organs and parts that can be assembled from 30 odd pieces for your educational amazement and the freaking out of your friends. It's amazing they don't charge admission.